Part of the hesitation to do fried chicken on the blog was because, well, let’s face it, have you ever had oven-baked fried chicken better than the fried version? There’s just something about buttermilk-soaked, double-breaded chicken going from drab to fab in a vat of hot oil that I never thought could be beat. Before starting this blog, deep-fry oil and cheese were two staples of my not-so-nutritional nutrition plan. But after several weeks of eating Chef Brian’s dishes – most prepared with only 1 teaspoon to 1 tablespoon of oil per serving – I just can’t eat oily foods like I used to. 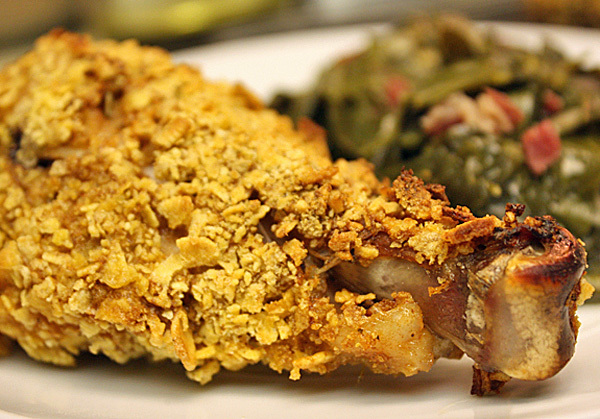 That’s where Week 15, Meal 3: “Fried” chicken with collard greens and ham hock comes in handy.